TOKYO – A Hello Kitty-themed “shinkansen” bullet train has debuted in Japan. Adorned with the cartoon icon inside and out, it’s a dream ride for fans of the internationally popular character. The special shinkansen had its inaugural round trip Saturday between Osaka and Fukuoka, connecting Japan’s west and south. In one car, a life-size Hello Kitty doll donning a train crew uniform and a hat – decorated with a pink bow, of course – greets passengers, offering a chance for selfies. 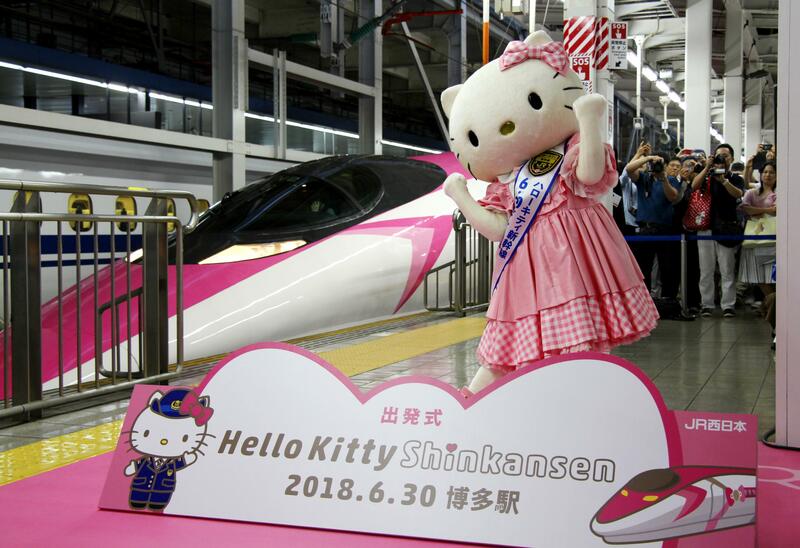 Hours later Saturday in Osaka, the train’s final stop, hundreds of fans waited for the arrival of the first Hello Kitty shinkansen, cheering and taking photos during its 16-minute stopover before it headed back to Fukuoka, according to Japanese media reports. Published: June 30, 2018, 10:03 a.m. Updated: June 30, 2018, 7:46 p.m.